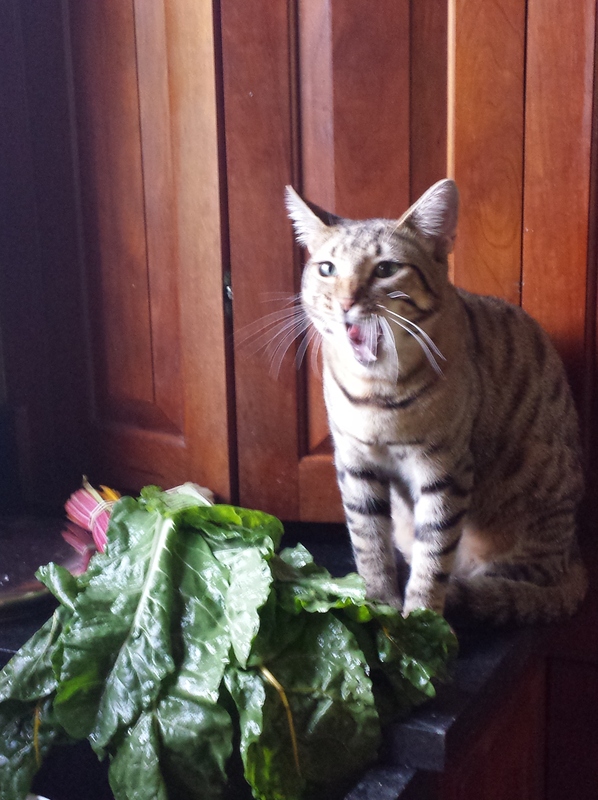 You MAY have in your box: strawberries, lettuce, kale, chard, beets, arugula, peas. Welcome back to SO MANY of you and welcome to all of our new members! I usually cover the housekeeping portion of the CSA in the first letter which is long and boring…so this year I covered most of it in the “start Date” email I sent out last week. Paula Red apple harvest has begun! These are the best early apple, nice and crunchy with more sweetness than the Early Macs…and just in time for school. This is the best time for making large stir fry and casseroles, freezing the excess. Eggplant can be cooked up (I like it sliced and baked on a sheet) and frozen for later meals; peppers sliced up and frozen in a sealed bag or container are handy for your winter recipes. I freeze mine in larger bags and just take out a handful or two, as needed. nectarines 😉 Naturally, peaches would work just as well! Tomato & Nectarine Salad (adapted from Boston Globe http://www.bostonglobe.com/lifestyle/food-dining/2015/08/18/recipe-for-lamb-spiedini-with-peach-tomato-and-mint-salad/Y2cdZ4ZU1QVu8fMXfu2fIJ/story.html) 2 T red wine vinegar Salt and pepper to taste 3T olive oil 2 large tomatoes, seeds squeezed out, chopped 1 cucumber, peeled and seeded, chopped 3 nectarines, peeled, chopped 2 sprigs fresh basil, minced In a salad bowl, whisk together the vinegar, salt, and pepper. Gradually whisk in olive oil. Add the tomatoes, cucumber, nectarines and basil. Some of it goes pretty quickly like freezing broccoli and other tasks are more of a day long venture, like canning salsa. I will be tackling the zucchini squares and cakes this week, as those are things the kids pack in their lunches all winter. I also need to get busy with the peaches, as that season will come to an end well before the broccoli is done. I am seeing a variety of other greens, including Chinese Cabbage or Napa (large, columnar head, crinkly leaves) and Pak Choi (smooth, large stems with rounded green leaves starting halfway up); there’s also a red pak choi. In addition to the HUGE bell peppers that have been in the boxes. I have also seen some beautiful broccoli and sweet melons. We harvest the melons ripe and melons harvested ripe are MUCH softer than those you find at the supermarket. If you are not going to eat it right away please store it in the fridge. The peaches are succulent. I hope you are enjoying the fruit. If you have been a member of another CSA before, you realize how special it is to get fruit every week! We are pretty psyched about the amazing tomatoes being harvested right now. Again, this is the time to get bulk tomatoes or squash if you need them. The onions are starting to fall, so we’ll be letting them dry off soon and starting the big harvest. I’ve been eating the first apples and that is always the first reminder that school is right around the corner. I’ll miss my great CSA help on Mondays and Glenn will be missing him on Fridays at Quincy J I cannot really believe Reid will be starting Junior year – and to think he’s been going to CSA with me for 17 years – one way or the other! We’ve watched your kids grow too and it looks like there is a marvelous crop of new CSA members expected in the coming months! Thanks for growing with us!!!!! Blueberries are fading, but the peaches are getting going…and apples could appear any time! 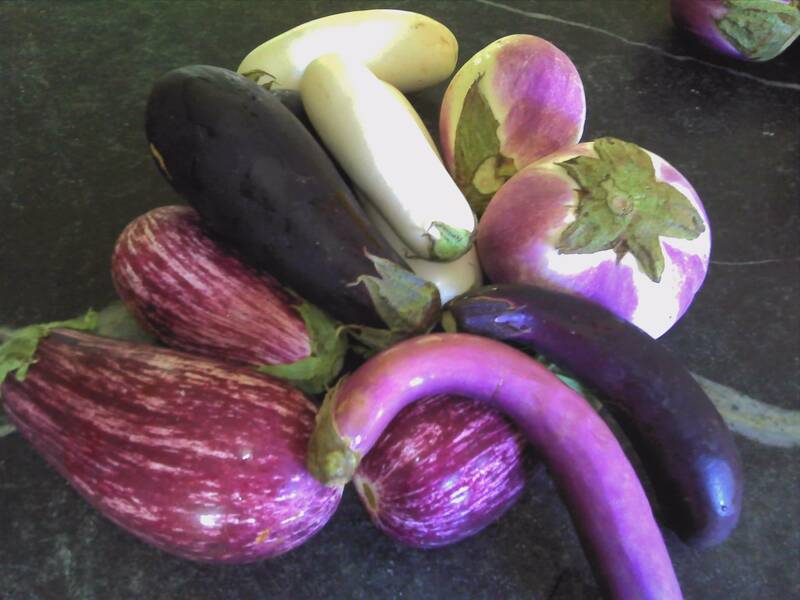 You MAY have any of these things: Summer squash, or cousa, cukes, pickling cukes, lemon cukes, corn, beans, chard or beets, tomato, potatoes, eggplant, peaches, broccoli, kale, lettuce … There’s an abundance of beautiful, exotic looking eggplants around, enjoy. Also, fresh eggplants have nasty thorns near the stem end, so beware. Still eating lots of cereal with berries, also salads and stir-fry. 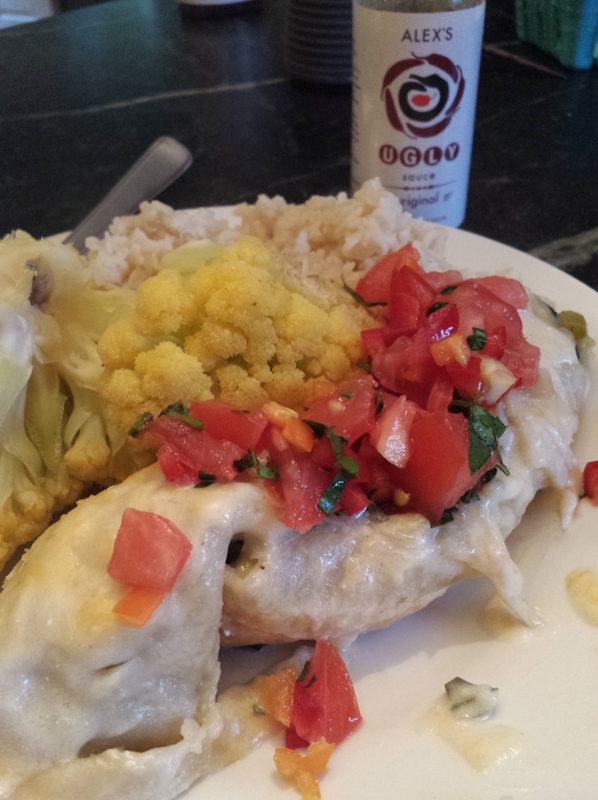 I made Swiss chard and cousa (use any summer squash) enchiladas with white sauce for dinner the other night – pretty tasty! I will get it up on the blog for sure. Now, right away, I have to tell you if you have never liked eggplant, and never tried ours, you have to try it again. As usual, the freshness and variety of our product simply tastes better than anything you have ever bought at the grocery store. Also, I have found that with eggplants, in particular, most people’s experience involves bitter, old, seedy eggplants that are cooked in a lot of grease. AND, who likes anything that is bitter and old? Thank you to all the members reading this that have humored me in the past and tried eggplant again. For the success stories (which is a large percentage) – yeah! For those who still don’t care for it, thanks for playing and you know you can swap your eggplant out for more greens or potatoes or what have you. Varieties: the basic dark purple ‘Classic’, the original white skinned (thus the name ‘eggplant’) ‘Tango’ – a very tender, white fleshed variety; Purple Blush – white to lilac skinned large softballs and a farm favorite; Neon – a magenta skinned elongated egg shape; Zebra/Nubia – a magenta-purple striped with white; Round Mauve an heirloom variety – pinkish-purple skin, Bride – slim, light rose with white stripes; Green Apple- as it name suggests in appearance only, some other elongated white one who’s name escapes me now; Rosa Bianca an heirloom variety- round with rosy-lavender streaks. Then there’s the Asian types: Little Fingers and Orient Express– dark purple skinned, long cylindrical; Machiaw – magenta, very long, and skinny. Well, what’s what? At first sampling, the Purple Blush, Rosa Bianca and the white are distinctly tender and sweet; they also cook faster. The others really have to be sampled side by side, and yes, they are different. We hope you can have fun with them as we do: baking, sautéing, grilling…. Heat oil in a large skillet over medium-high heat until hot. Add eggplant and onion; sauté 8 minutes or until onion is browned. Stir in garlic; sauté 3 minutes. Add salt, pepper, and pasta sauce; bring to a simmer. Reduce heat, and cook 5 minutes. Remove from heat; stir in basil. Toss eggplant mixture with pasta. Sprinkle with 1 cup cheese; toss gently. Top evenly with remaining 1/2 cup cheese. Serve immediately. We still need help at the Boston Public Market. If you know anyone who is reliable, has a personality and is a quick study, we’d love to talk with them! It’s a lot of fun and it’s a long day to cover, so even if it was one shift, one day a week, we could use the help. 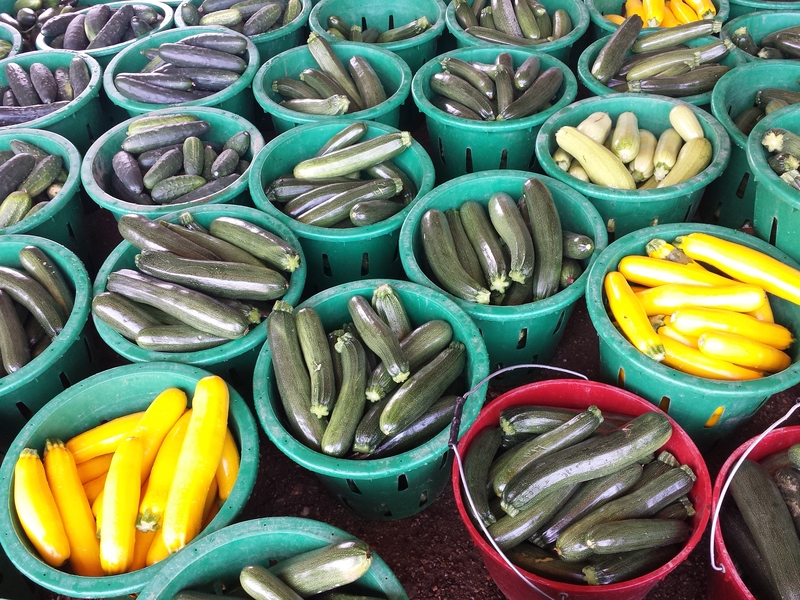 It is the time of year to get tomatoes and cukes, pickles, and squash for canning or processing. Please let me us know if we should have extra for you at your pickup location. Pickles are $20/box, tomatoes are $25/box. This is what I used, but you modify however based on how many you are feeding and what you have on hand. I used a zucchini, a cousa, a mole, and a Hungarian wax. The girl child is not a fan of super spicy food, so we added some Alex’s Ugly individually. 2 bunches Swiss chard, remove the bottom few inches of stem and discard, chop the remainder of stem and leaves small. 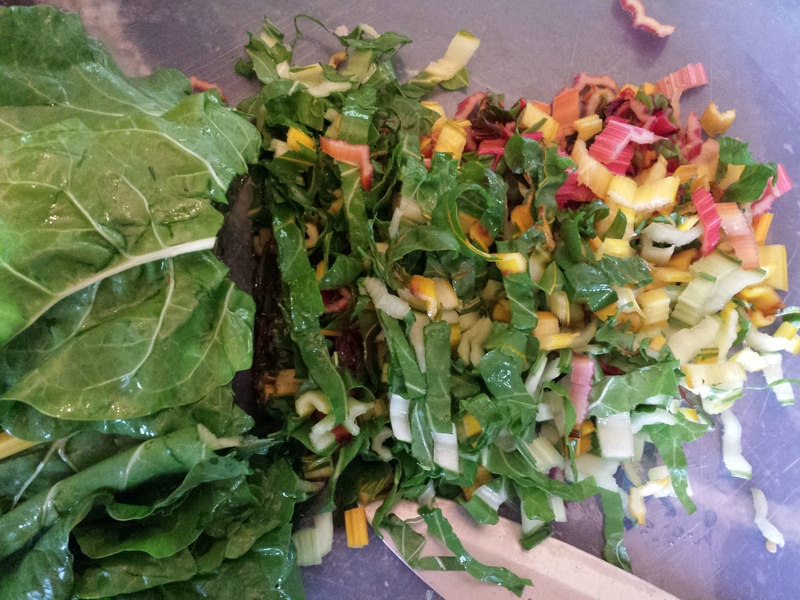 Chopped rainbow chard, use the stems too! 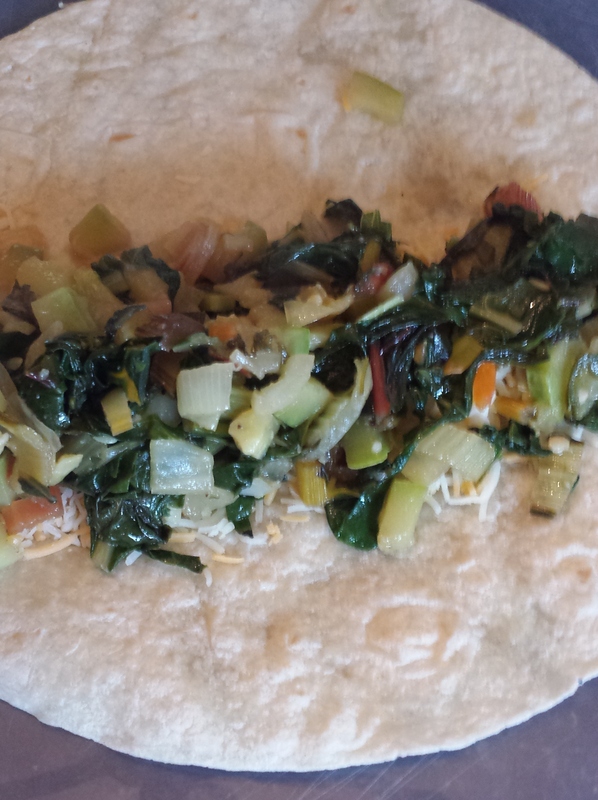 Sauté the squash, pepper, onion, garlic and chopped chard stems for about 10 minutes in a few Tb of oil. 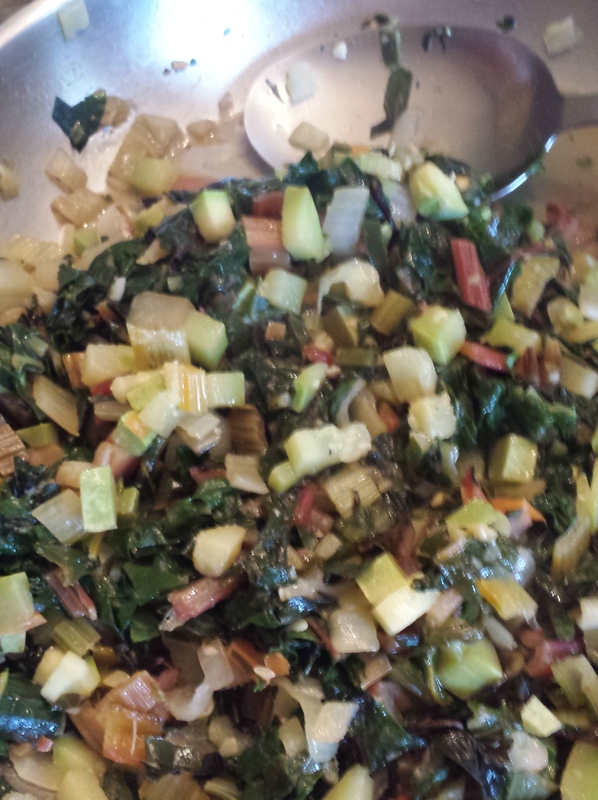 When you sense the squash and chard stems are fairly tender, add the chard leaves, tossing as much as possible and cover. Every few minutes toss around some more until the leaves are soft and everything looks cooked. Leave the lid off if you have plenty of liquid so some may evaporate. 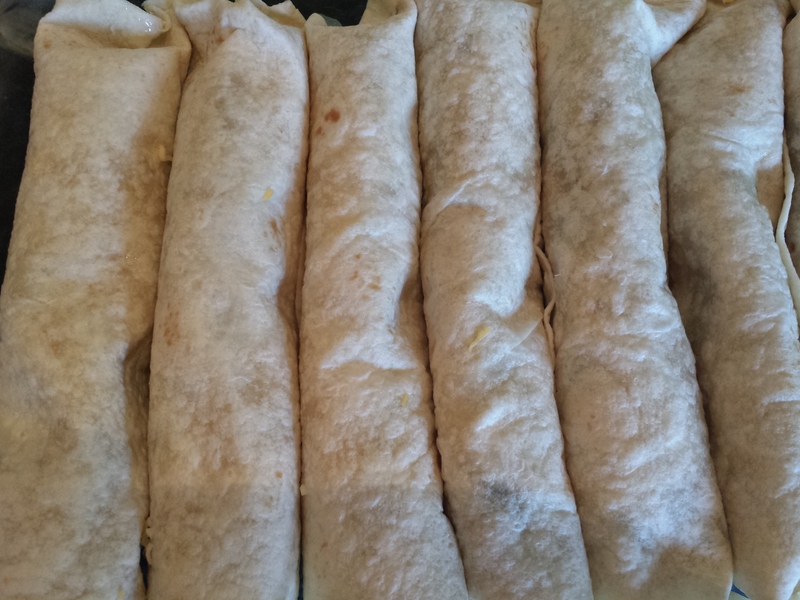 In each burrito wrapper, use ½ cup cheese and 1/8 of the filling, roll up and place in greased 9×15 casserole. 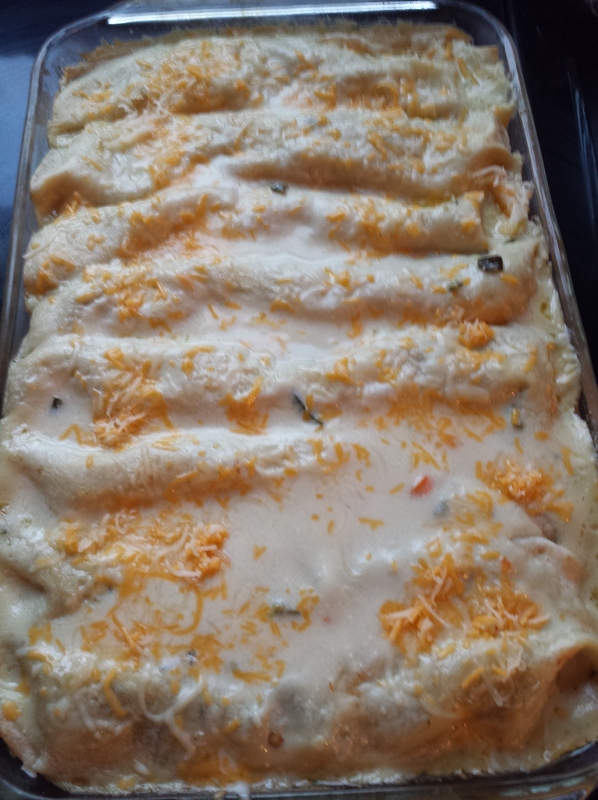 Cover with white sauce, edging enchiladas so sauce will get down between and around. Bake uncovered at 425 degrees for 25 minutes. 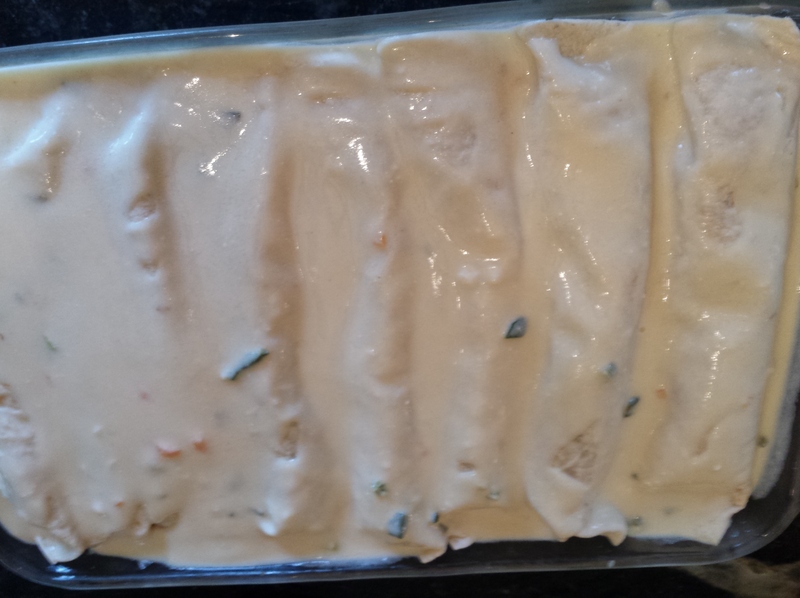 Melt butter in saucepan, add flour and stock, stirring until nice and thick. Add the sour cream and peppers. Set aside while you assemble your enchiladas. I made a nice fresh salsa to go on top by dicing 2 tomatoes and two cherry bombs, adding a little salt, basil, and lime juice. The bounty has been so wonderful Glenn has wanted to share it with you all! The weekly boxes are exceeding the value of your CSA subscription and making it such an awesome value this year. Yeah! 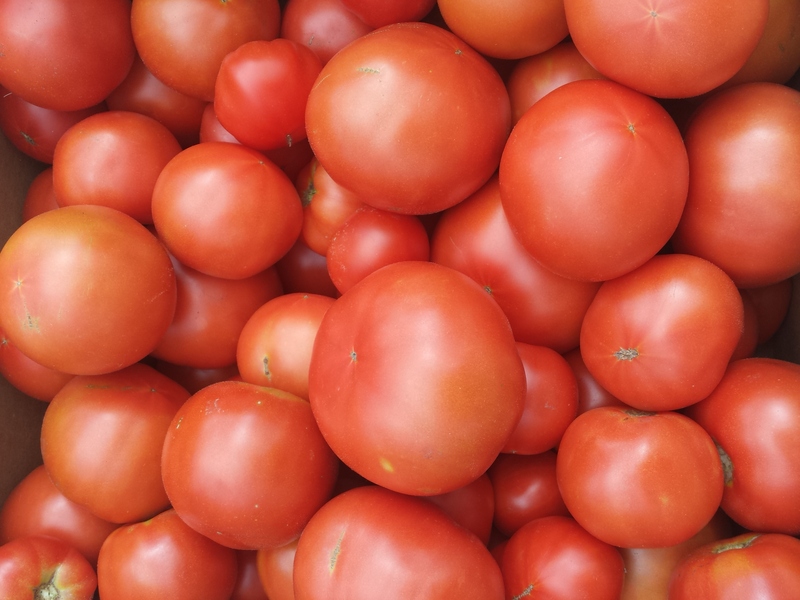 This week we continue to enjoy the corn, blueberries, tomatoes, lettuce, cukes, squashes, eggplants, peppers, peaches, your choice of greens, potatoes, onions… There may be a little gap in the lettuce, so it may or may not be in your box. If not, I will try to send it along as an option. I think our son Reid would go into withdrawal if there was no lettuce in the house for a week;) Sunday night I returned home from BPM at 11:30 to find a nice salad, complete with lemon cukes, waiting for me in the fridge. Good boy! The eggplants are coming in and you may see the long, skinny Asian types first. These are marvelous grilled or sautéed up with some summer squash and a tomato. We grow dark purple, magenta, white and green and all of them are lovely. There are also several long sweet peppers: Cubanelle which are long and light green, turning orange and then red; Spanish Spice/Carmen which are long and medium green then turning a vibrant red; and Mama Mia a Golden yellow Italian fryer. The hot pepper lineup is a little more complicated: Mole are long, skinny, very mild heat and very dark green; Pablano(green)/Ancho(red) are medium hot, heart shaped and very dark, shiny green (pablano) and turning brick red later (ancho); Numex Joe Parker an Anaheim; Hungarian Wax are medium hot (but hotter than the pablano), elongated and smooth yellow-dark orange; Cherry Bomb are hot green to red and cherry shaped; Jalapeno are hot, dark green-purple-red, pointy sausage shaped; Serrano are hotter, smoother and more elegant looking than the Jalapeno; Cayenne are hot-hotter, very long, slender, wrinkly, green-red; Thai Dragon are smaller than cayenne, slender and about 3” long, Habanero are super-hot, wrinkly lantern-shaped, lime green-orange-red, and finally, the Ghost pepper, the hottest of the hot. There’s probably a few I am missing, because we love to experiment and we also trial plants for a few seed companies. *The hotter, drier and sunnier the weather, the hotter the peppers. Cut ripe tomatoes into halves (small tomatoes) or thirds (large tomatoes) along the midline, not through the stem. Arrange tomatoes on cookie sheet and sprinkle each with a pinch of salt, some thyme and some rosemary. Drizzle on a little balsamic vinegar and olive oil. Add a thin slice of fresh garlic clove on each. Roast at 325 degrees for about 1.5 hours, or until they shrink in half and look done. They will be very soft and extremely delicious. You can line the cookie sheet with parchment paper to make it easier to clean. Vegetale al Forno this is a super yummy and a nice one dish meal of squash, eggplant and tomato. It is a great side dish with meat. Glenn suggests I leave it up to you! Please weigh in if you were planning on coming to the potluck. If you have never been, we cook corn, slice tomatoes, hang around and visit, walk the farm a little, pick berries… It’s pretty low key. Meanwhile, Glenn is out scouting the farm right now and I look forward to the update about what’s coming and what’s new for this week. The onions they are pulling are gorgeous and plentiful. The apples are sizing up, and I saw some melons come through the other day and the one I ate was delicious!